Surface-enhanced Raman spectroscopy (SERS) is a highly sensitive and versatile analytical tool that is widely used in biosensing applications. In conventional Raman spectroscopy, molecules are detected by their characteristic scattering of laser light, but the sensitivity of the standard method is relatively low. By detecting the same Raman scattering from molecules adsorbed to rough metal surfaces, however, the sensitivity can be enhanced remarkably, even allowing the detection of single molecules (see image). Unfortunately, the mechanism of this enhancement is not well understood and is strongly dependent on the combination of surface and molecular target. Malini Olivo and co-workers at the A*STAR Singapore Bioimaging Consortium and Institute of Microelectronics have now developed a new class of surface that provides a much-needed sensitivity enhancement for the detection of glucose. The new substrate promises the fast, direct and accurate detection of glucose in solution at physiological concentrations. Olivo and her co-workers have been investigating SERS for the measurement of glucose in biological samples. 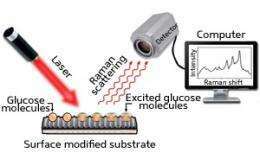 Glucose has very low Raman scattering efficiency and existing substrates for SERS fail to bring the methods sensitivity of detection up to a level suitable for detecting the typical concentrations in real samples. Instead of the commonly used rough metal substrates, the researchers turned to silicon, which they etched to form a well-defined pattern of nanogaps. They then coated the patterned silicon with thin layers of silver and gold. In tests comparing the new substrate with commercial substrates for glucose detection, Olivo and her team found that the silicon-based substrate gave the sensitivity boost they were looking for, which they attribute to the uniformity of roughness provided by the nanogap pattern. We were actually very surprised by our substrates high reproducibility, say Olivo. The best reproducibility reported previously for glucose was only about 10%. However, due to the special design and pattern of our substrate, we achieved reproducibility of about 34%, which is outstanding. The nanogap substrate also provided good sensitivity for the detection of glucose in the physiologically important 025 millimolar range. Olivo and her co-workers are already building on their success with work on an analogous system for sensing proteins. We would like to translate similar SERS substrate platforms to optical fibers in order to develop a minimally invasive in vivo SERS platform for clinical diagnostics, she says. The researchers have high hopes that small sensors based on this SERS platform may one day be implanted into patients for real-time glucose sensing. More information: Dinish, U. S., et al. Development of highly reproducible nanogap SERS substrates: Comparative performance analysis and its application for glucose sensing. Biosensors and Bioelectronics 26, 19871992 (2011).